This article is about the English businessman. For the companies bearing his name, see Dunhill (luxury goods) and Dunhill (cigar). Alfred Dunhill FRSA (30 September 1872 – 2 January 1959) was an English tobacconist and inventor. He is the progenitor of the Dunhill luxury goods company and the Dunhill branded tobacco products from British American Tobacco (now two independently owned entities). 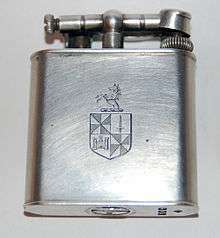 Dunhill passed the chairmanship of his company to his son Alfred Henry in 1929, taking retirement due to health reasons. He left his wife and moved to Worthing to join his long-term mistress, Vera Mildred Wright (1902–1976), who changed her name to his by deed poll. Dunhill married Wright on 28 March 1945, shortly after the death of his wife. He died in a nursing home in Worthing on 2 January 1959, and was cremated at Golders Green Crematorium. He left gross assets of £74,117 (equivalent to £1,555,099 in 2015). His wife survived him. ↑ "Alfred Dunhill, 86, tobacconist, dead". The New York Times. 5 January 1959. 1 2 3 4 "Mr. A. Dunhill". The Times. 5 January 1959. 1 2 3 4 5 Linda Welters; Abby Lillethun (2011). The Fashion Reader: Second Edition. Berg. p. 509. ISBN 978-1-84788-589-0. Retrieved 20 February 2014. ↑ Foulkes, Nicholas (2007). "Mechanisms for the Modern" (PDF). QP magazine. Retrieved 24 April 2014. 1 2 3 4 5 6 7 8 9 10 11 12 13 Trompeter, Barbara. "Dunhill, Alfred (1872–1959)". Oxford Dictionary of National Biography. Oxford University Press. Retrieved 25 December 2013. ↑ "Mr Alfred Dunhill". The Times. 9 July 1971. ↑ Chris Harrald; Fletcher Watkins (2013). The Cigarette Book: The History and Culture of Smoking. Skyhorse Publishing Company. p. 110. ISBN 978-1-62873-241-2. Retrieved 20 February 2014. 1 2 "Mary Dunhill". The Times. 27 February 1988. ↑ Hauptfuhrer, Fred (13 April 1981). "For London's Richard Dunhill, Life's a Lovely Pipe Dream". People. Retrieved 24 December 2013. ↑ Moorcroft Wilson, Jean (2003). Siegfried Sassoon: The Journey from the Trenches: a Biography (1918–1967). Psychology Press. pp. 161–2. ISBN 978-0-415-96713-6. Retrieved 20 February 2014. ↑ "Brand New". Bloomberg Businessweek. 2 October 2005. Retrieved 24 December 2013. ↑ H.S.H. "The Pipe Book by Alfred Dunhill". Man. 25 (May 1925): 78–79. doi:10.2307/2840712. JSTOR 2840712. ↑ "Books and Authors". The New York Times. 23 November 1924. ↑ "Alfred Dunhill, Ltd.". The Observer. 7 April 1929. ↑ "Deaths". The Times. 22 June 1959.